Higgins has received a highly commended award in the national NZ Contractors Awards - Category 3 (projects valued $5m - $25m) at the New Zealand Contractors’ Federation Gala dinner. The Manawatu Gorge Slip Remediation project, was judged independently by a panel of judges drawn from across the contracting and consulting sectors. The work was judged over seven major categories : planning and control, site conditions, relationships, risk, entry documentation, customer satisfaction and finally construction. 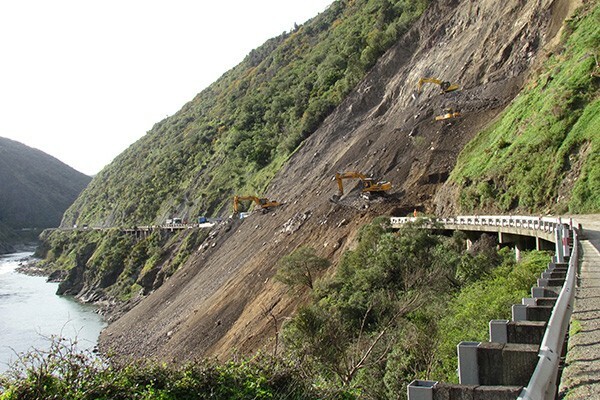 A multi-discipline team responded a massive landslide on State Highway 3 which continued to become the largest road landslide in New Zealand history. The Higgins lead team worked effectively in this community emergency situation to remove the slip debris, stabilise the slope and reinstate the road. The team included the New Zealand Transport Agency (NZTA), MWH, Higgins and BBO. With a committed and sustained effort, they returned the road to full service 13 months later.